I was trying to export individual slides from LibreOffice Impress but I had to select each of the slide and then export it which was getting really really irritating with larger slides. With a quick search, I found an Impress extension that lets you export all the slides at once. So the addon I was talking about is Export as Images extension which lets you export all the Impress slides or Draw pages into different image formats. The formats supported are JPG, PNG, GIF, BMP and TIFF format. 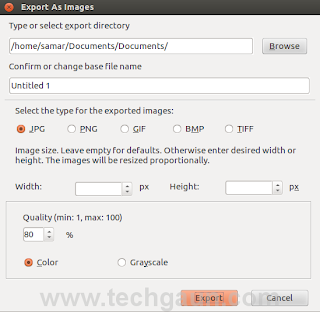 Once you install the extension, it adds a menu entry "Export as images..." to File menu and allows you to choose a file name for exported images, image size as well as some other parameters. First grab the extension from HERE or see if newer version is available from HERE. Once you have downloaded the extension, the installation is pretty straightforward. Open up the Extension Manager from Tools menu and then click on Add. Now navigate to the folder containing your newly downloaded extension and select it. Once the installation succeeds, make sure to restart your LibreOffice Impress to make sure the extension gets activated. 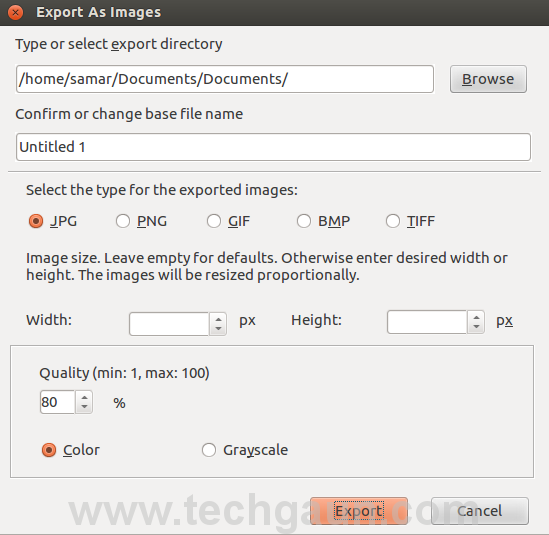 Now open any presentation and to export all the slides as images, go to Files menu where you'll find a new entry Export as images... just below the Export... option.